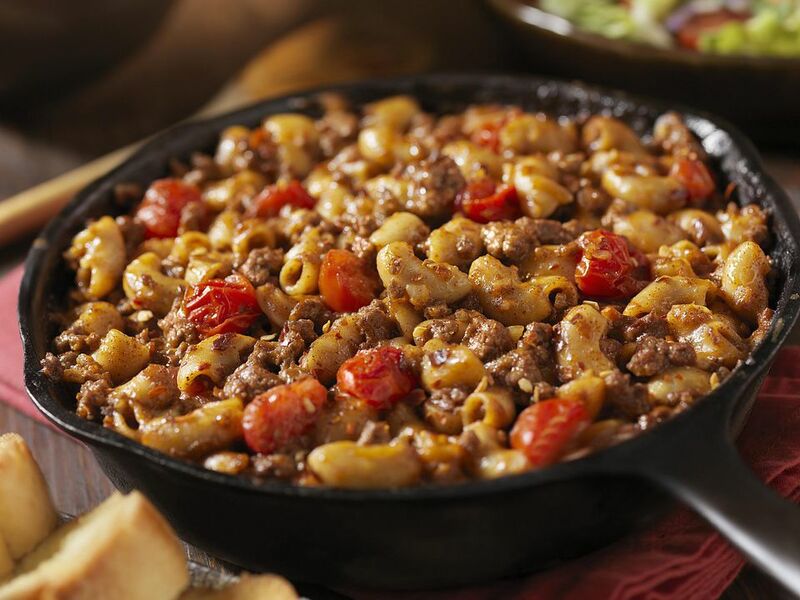 This simple one dish recipe uses orzo pasta, tomatoes, ground beef, and feta cheese for a delicious Greek inspired meal. I always use fresh rosemary in this, because dried rosemary is just a bunch of little needles. If you can't find fresh rosemary, just omit it; this recipe will still have plenty of flavor. You can use any other type of pasta you'd like, even elbow macaroni. Just make sure you keep testing the pasta as the recipe cooks to make sure it doesn't overcook. You can change the herbs and spices in this recipe too. Omit the rosemary and add some basil, or omit the oregano and add marjoram. Just make sure you write down the changes when you make them. Brown the ground beef, onion, and garlic in large skillet. Drain well. Add the bell pepper, pasta, diced tomatoes, tomato paste, water, rosemary, oregano, cinnamon, salt and pepper; stir to combine, making sure pasta is covered by liquid. Heat the mixture to boiling, then reduce the heat, cover, and simmer 11 to 13 minutes, stirring frequently, until the orzo is tender. I stir this every two minutes. The orzo has a tendency to sink to the bottom of the skillet and stick. You need to scrape the bottom of the skillet well every two minutes. Remove the skillet from the heat, sprinkle the cheese and olives over the casserole. Cover and let stand 2 to 4 minutes until cheese softens. Meanwhile, combine the sour cream, rosemary, and cherry tomatoes in a small bowl. Spoon this mixture over the food and serve immediately.